Greg called out to me a moment ago to say he was setting the alarm, which means the kitchen, dining room, and lounge are all out of bounds until morning. I have nearly a wing of the ground floor to myself, including my bedroom, its adjoining bathroom, and Greg’s study – a room that would have been intended for a live-in maid when the house was built. There aren’t any outer doors in this section of the house and motion-sensing beams operate all along the perimeter fence, at the doors, and at each exterior corner of the building. Greg and Dylan sleep marooned on the upper floor, and the stairwell off the kitchen, which ends at the back door, is also alarmed. The dogs stay upstairs with them. It’s easy to become paranoid about noises. The house settling or weight on a floorboard? Wind in the chimney or a window opening? I know that no one could enter the house now without triggering the alarm, unless they were more than petty burglars. They’d need whatever technology is necessary to disarm the system without any of us being aware of it. Greg isn’t anyone of real importance, and I’m definitely not, so I know that we have nothing to fear except petty burglars, and even then the fear is more about confrontation than loss of property. Confrontation, pain, and death. I’m nearly asleep when the electronic howl pulls me up, eyes throbbing in time to the siren. I haven’t felt like this since I was a child. My heart’s in my tongue, every part of me vibrates with fear. The alarm echoes down the corridor and I slip out of bed to the door, crack it open, but can see only darkness. I sprint back across the room to the windows and edge the shutters open. The garden is dim under its night lights and my breath comes out quick and shallow. The dogs are silent. And then the alarm stops all at once, pulled into a vacuum of silence, and Greg calls from the end of the corridor. He can’t see anything outside. It must have been an animal, or a power surge. The dogs aren’t concerned. The alarm company phones to be sure that everything’s okay, and Greg gives them the password that indicates it is, that we aren’t being held at gunpoint – there’s a different password for that – and we all go back to bed. 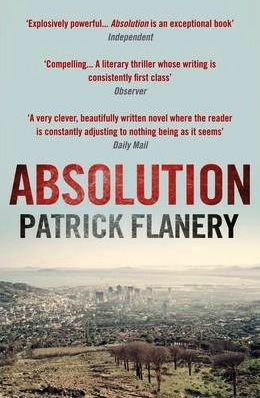 Extracted from Absolution by Patrick Flanery (Alantic Books), which was short-listed for the 2013 RSL Ondaatje Prize and has been short-listed for the 2014 International Impac Dublin Literary Award. 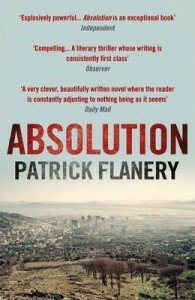 © Patrick Flanery, 2012. For more about the writer’s work, see his website.